When you spill bleach on your commercial carpet, it can deter customers and clients; and if you are in the hotel or reception hall industry where customers rent out your space for holidays and events etc, it can be a devastating blow to your bottom line. The key to removing bleach spots without any damage being done is to work quickly. You need to have the tools needed on hand so that if the problem arises, you are ready. Carpet Dye-Tech is here to share a couple of different methods that have been proven to be successful at removing bleach from carpet as soon as a spill happens. It is important to remember that whenever you are faced with a bleach spill on your carpet, you don’t just act quickly, but you act right. You should never scrub or rub the area where bleach has spilled. The first thing you need to do is to grab a paper towel and get it wet. One the paper towel is wet, you can work to blot the area where the bleach has spilled. When you scrub the carpet, it will cause the bleach to further soak into the carpet fibers, causing more damage. There are two methods that have been shown to show success in removing spilled bleach from carpet. Using only ¼ tsp of dish soap and 1 cup of warm water, gently pour the solution over the top of the bleach stain. You should allow this solution to sit on the area for five minutes before working to remove the bleach. You need to be working from the outside in as to not cause the bleach to bleed any further. 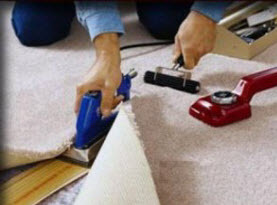 Once you have removed it, you need to rinse the solution away and let the carpet completely dry before walking on it again. 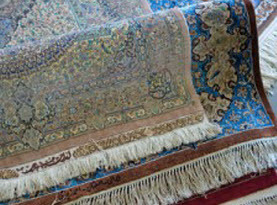 Method #2 White Vinegar to Treat Bleached Carpet? The next method will require white vinegar and warm water. With 2 Tbsp of white vinegar and 4 cups of warm water, you should saturate the bleach stain and allow the mixture to sit for 5-10 minutes. After that time has passed, use a white cloth or sponge to soak it up and you will notice the bleach will slowly disappear from the carpet. You may have to repeat these steps more than one time until there is no longer any sign of bleach remaining. When you have experienced loss of color in the fibers of your carpet, you may think that all is lost. That isn’t true. You can call on the professionals at Carpet Dye-Tech to provide you with exceptional carpet dyeing services that will literally erase any trace of bleach on your carpet. 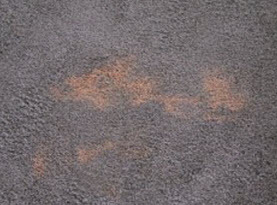 We have the ability to match your carpet color exactly so that there is no sign that an accident ever happened. It doesn’t matter how bad the bleach spill was, there isn’t a bleach stain that we don’t have the ability to repair! 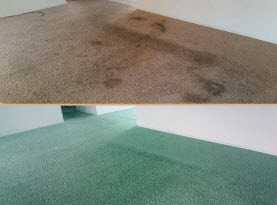 If you have carpet that is damaged due to a bleach spill, you can call on Carpet Dye-Tech to provide you with carpet dyeing services to solve your problem. Call us today!